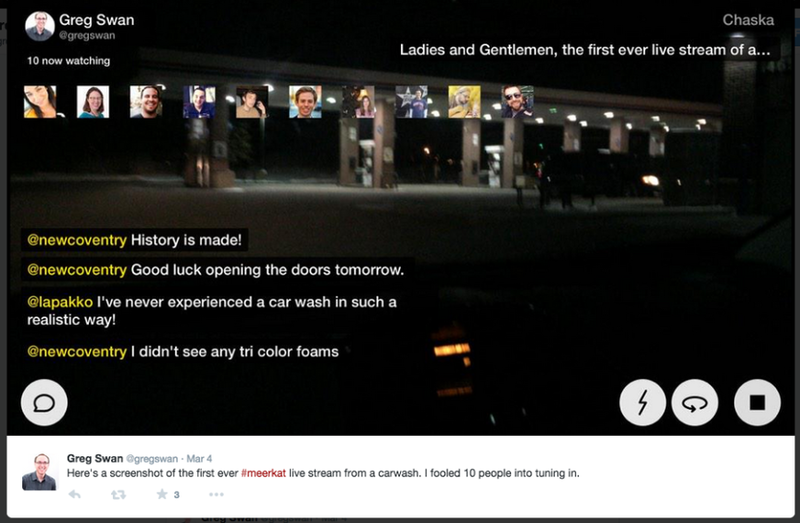 Will Meerkat Be the Next Twitter–Or the Next Ello–For Marketers? The last week, my Meerkat notifications have been BLOWING UP! Of course, that’s on me. I could turn those off anytime I want. But, I chose to turn them on initially to see how mad the rush was to the new platform. And boy, has it been a mad rush. In case you haven’t heard, Meerkat is the new social video app that uses Twitter as its engine to share live video streams across the web. And, it’s much like Snapchat–once it’s gone, it’s gone for good. Like many of the previous new social media apps and platforms, tons of folks (especially in our world–PR and marketing) have rushed to try out the new tool. As a result, we’ve seen everything from local tech nerd and new space150 VP of everything, Greg Swan, Meerkat a car wash (see above) to folks like Gary Vaynerchuk setting up advance Meerkats of his #AskGaryVee show. So, we’re obviously very much in the experimental phase. But, the question on everyone’s mind is really pretty simple: Will Meerkat blow up and becom the next Twitter? Or, will it flame out as fast it as it came on the scene and become the next Ello? It’s that time of year. Yep–it’s that time when agency folks and digital geeks from across the country gather in northern Texas for one week to talk all things digital and interactive. What better time to launch a soon-to-be-killer-social-media-app? Twitter capitalized on that timing years ago. Foursquare–same thing. Meerkat knew what it was doing. Now they have thousands of geeks captive in Austin later this week who will be sharing their every move on video (spoiler alert: This could get ugly. I mean REAL ugly. And I plan on tuning in!). At the very least, Meerkat should earn a nice chunk of additional media hits, and completely flood Twitter streams across the world. From a marketing standpoint, nothing seems hotter than video content right now. Facebook is pushing it hard–so hard that video content is completely crushing text, link and photo updates on the platform. YouTube continues to be an “A platform” with marketers and advertisers. And, surprisingly (to me, at least), brands continues to flock to Vine to partner with “influencers” to co-create content. So, along comes Meerkat. Social video–powered by Twitter. That makes sense right now, right? Feels much more Twitter than Ello to me. I thought this was Ello’s big problem from the get-go. It didn’t solve a problem for users. Sure, it CLAIMED to solve a problem (no more brand advertising!). But really, it didn’t (Turns out, no one cares about that). Now, Meerkat doesn’t solve a problem either. No one was clamoring to share real-time video streams on Twitter. But, truth be told: it’s just fun. That’s what you’re seeing right now. People having fun. And that’s a big part of social media. I wouldn’t discount that at all. So, does Meerkat have a viable value prop? Not really. But, people are having fun right now. And, if they can sustain that somehow and figure out a way to refine the experience a little, again, I’m feeling much more Twitter than Ello. From a marketing perspective, the big issue with some of the other social apps/tools unveiled recently has been they’re simply not useful. What’s the immediate use for Ello? What about Path? Brands never hopped on that one. But Meerkat is stupidly easy to use. And, it could end up being a fantastic storytelling tool for brands. Boom–instant usefulness for marketers. Think about the potential, just from a storytelling perspective. I know it’s ephemeral, but so is Snapchat and brands are already all over that. To me, it could be a GREAT publishing tool–for media outlets and brands. Again, much more Twitter than Ello here. One question we’ve heard a lot in regards to Meerkat so far: How is this any different from Ustream and other livestreaming tools of the past? To me, one big thing comes to mind: It’s effing simple. I mean, REALLY effing simple (you can probably figure out what “KIFS” stands for). Anyone who has tried it knows what I’m talking about. Oh, and it actually works. I remember the early days of Ustream when the video stream would routinely go down. Now, that was years ago–tech was different. So, that’s not entirely fair. But man, Meerkat is awfully easy to use. Much easier and more intuitive than Twitter was back in the 2007. And a helluva a lot easier and more intuitive than Ello was (I still can’t figure that one out). Again, more Twitter than Ello. So, as you can see, I guess I’m leaning HEAVILY toward Meerkat being the next Twitter–not the next Ello. The reality is it’ll most likely fall somewhere in the middle. How far it leans toward Twitter or Ello will be the question. And, that will determine if marketers jump in and start using it was a storytelling tool. What are your initial thoughts of Meerkat? Think it’s got a chance to be the next Twitter? This article was syndicated from Business 2 Community: Will Meerkat Be the Next Twitter–Or the Next Ello–For Marketers?